On the 8/2/2016 following one of our group meetings at Balook , outside the visitors centre just after sunset I hung out a white sheet with a UV light in the hope of finding a few interesting insects to photograph and potentially upload on to our “Friends of Tarra-Bulga National Park” project on http://www.Bowerbird.org.au. The conditions were windier than ideal but an interesting array of creatures did land on the sheet including a medium sized brownish moth with distinctive white spots on its forewings, it landed without fanfare and hung around just long enough for me to take a quick photo. Back home the next day, I consulted Peter Marriott’s book Moths of Victoria and after much head scratching and flicking back and forward between pages I managed at last to find what I thought could be match, a species called Chrysolarentia pantoea or the “Variable Carpet Moth”. 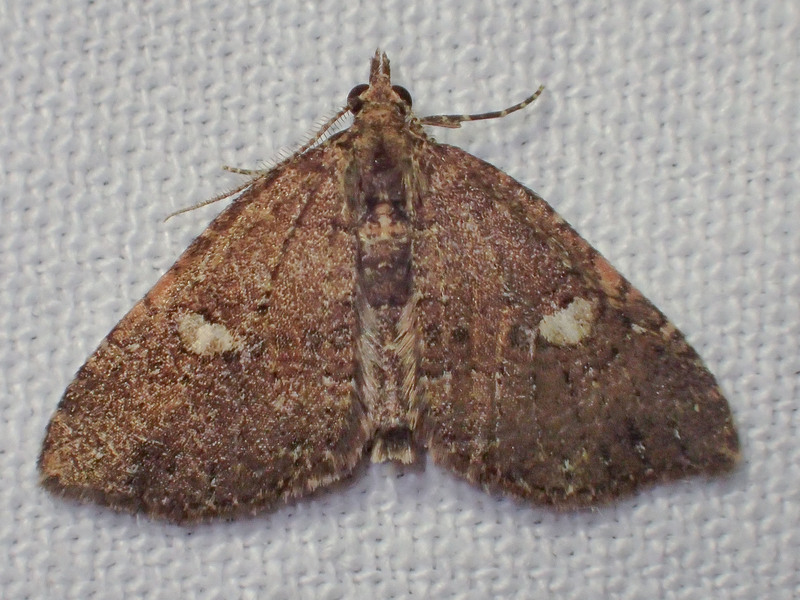 In Moths of Victoria, photos of this moth are of preserved museum specimens captured in the Otways and Lamington National Park (on the Queensland/NSW border). Peter writes in his book that no specimens of this moth could be found in collections taken between these two sites. He did predict that other populations of this moth could be established in cool temperate rainforest or other similar natural habitats. As I was not 100% confident with my identification and thought this sighing could be of interest, I contacted Peter who to my satisfaction agreed that I was correct and it was in fact Chrysolarentia pantoea, that I had managed to photograph. Remarkably he said that it was the first time to his knowledge that this species has been recorded in Victoria since the last museum specimen had been captured near Lorne way back on the 8/2/1907. That is exactly 109 years to the day between sightings! We always cross our fingers and hope for favourable conditions on the morning of our annual Lyrebird Survey which this year was held on Saturday May 30th. This year there was no rain but unfortunately the wind was up and noisy gusts were swirling through the canopy. The logistics of getting a large crew of volunteers up and ready to participate at 6.15am means that we can’t afford to be flexible with our dates so it is a matter of carry on regardless. This year we had 22 volunteers turn up for the count, with most people pairing up, we were able to cover 12 out of our 16 monitoring stations, as is often the case the 4 stations in the southern section of our count area were left out. Volunteers did a great job of arriving by 6.15 and by the time instructions were given and stations allocated it was still a rush to get into position. I found that the sun was rising and some birds had started calling a few minutes before I made it to my monitoring point at 6.55am. The next ½ hour was spent listening out for birds, at our site we could hear calling from three directions and once bearings were taken and noted we just settled in and enjoyed the surrounds. I noted some noisy Yellow-tailed Black Cockatoos moving in the canopy overhead as well as the odd loud crack from randomly scattered Eastern Whipbirds may potentially cause confusion for novice counters. Once our time was up we headed back along the track and soon came across a live sighting of a female Lyrebird (or perhaps a juvenile male?) wandering along the path. Back at the guest house we once again had a great breakfast (thanks to Torben and Pam). After all the monitoring sheets were handed in it was time to analyse the results. The number of birds detected this year was down, although hopefully this is not cause for alarm; the survey relies on hearing the calls and the background noise of the wind makes them more difficult to detect. We definitely had 4 male birds calling in the survey area with one other likely one. Instances where it was noted that birds were calling very close to monitoring stations, helped to identify some of the Lyrebird locations with certainty. A big thank you to everyone who made the effort to drag themselves out of bed so early and travel up to Balook to help out, your efforts to help conduct our annual surveys and monitor the local Lyrebird population is very much appreciated. Also thank you to our Ranger Craig who does a fantastic job setting up the monitoring stations and organising the troops. At the start of the count Craig pointed out that this was our 20th Annual Lyrebird Survey and that he had attended every one. Next year will be a big one (our 21st). Clink on the link for a pdf map of the survey results. 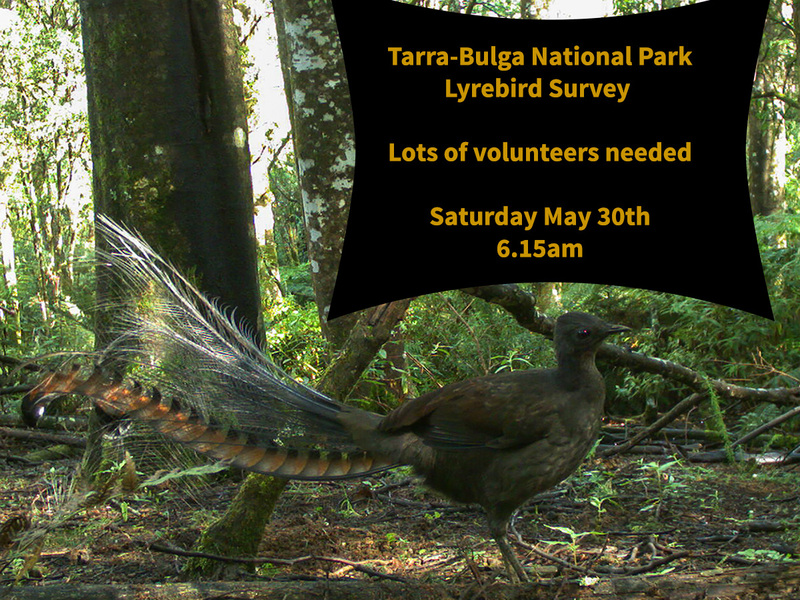 Our annual Lyrebird survey is coming up on Saturday May 30th. The meeting place is at the Tarra Bulga National Park Visitors Centre at 6.15 am. On arrival the recording process is explained and people are allocated to various monitoring points around the Bulga Park area. The survey begins at sunrise with the first Lyrebird calls and only takes around half an hour. Following the morning chorus, a free cooked breakfast is on offer at the Tarra-Bulga Guest House. If you would like to come along you need to contact us (by Wednesday May the 27th on 0488 035 314 or email friendsoftarrabulga@gmail.com. Wear warm clothing, a parka, bring a watch, a torch and compass (optional). 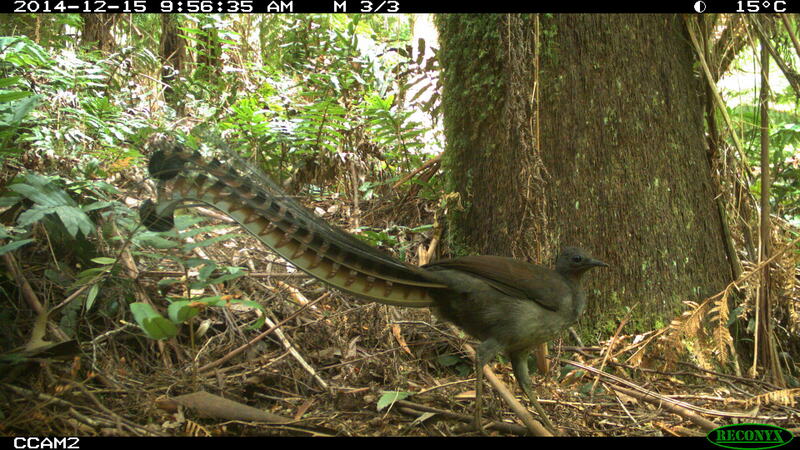 Lyrebird Numbers Up, Brush Bronze-wing Population Explodes! Friends of Tarra-Bulga have now been using remote cameras within the park to monitor wildlife for over three years. The table below shows results adjusted for the number of days cameras have been active in the field. We currently have eight cameras that are moved around to different sites on a regular basis. As of January 2015 the cameras had spent a combined total of over 5000 days in the field and were triggered by animal movements over 10,000 times. The results show a number of interesting trends. For mammals most species have not varied much in the frequency of sightings over the 3 years with a few exceptions. There was a large jump in Koala sightings in 2014 most were at one site where a Koala developed a routine of passing by every couple of days. 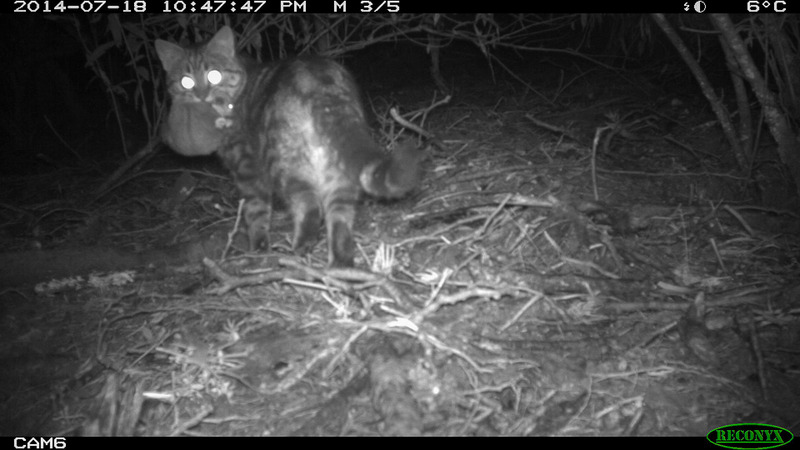 Feral Cat numbers have risen each year and Ring-tailed Possum sightings seem to have declined. (the figures for Ring-tails have been influenced heavily by one popular site). Lyrebirds captures by our cameras doubled each year. There has been a massive jump in the numbers of birds that the cameras are detecting. 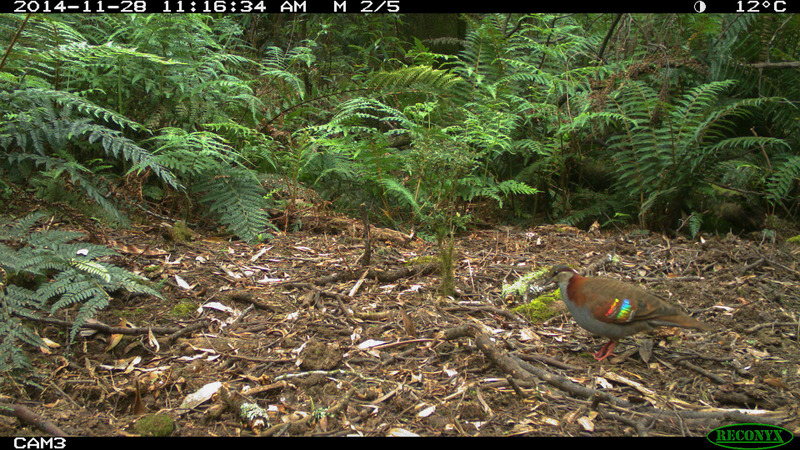 The number Lyrebirds passing cameras have doubled each year. Bassian Thrush (Zoothera lunulata) sightings increased around 600% in 2014 and Brush Bronze-wing numbers skyrocketed from only 15 sightings in 2013 up to 404. Crimson Rosellas, Eastern Whipbirds, Pilotbirds and *Common Blackbirds all had a significant rise in detection. Two smaller species the White-browed Scrubwren and the Superb Fairy Wren were also ‘captured’ more often. We have had massive increase in the number of Brush Bronzewings recorded. A reason for the jump in bird numbers may be due to camera placement. One site used in 2014 was very popular for ground dwelling bird, however this does not fully explain the rise, other camera sites were used in both years and showed a big increase ground dwelling birds from 2013. Fox control efforts in recent years may also be a factor helping the birds numbers increase. Our results have picked up a small rise in Fox numbers over the last few years. As our monitoring continues, time will tell if this greater abundance of bird sightings will be maintained. Perfect conditions this year for our annual Lyrebird count, with a beautiful still and mild morning. Another bonus was thirty keen volunteers fronting up for the 6.15 am, which meant we could cover all our 16 monitoring points. Thank you so much everyone for turning up, with many coming from far and wide to participate. From our mapping we identified at least 10 male birds calling, which in memory is one of our best results. At several stations tracing birds was easy because they were observed calling from trees directly overhead the post. The folk monitoring the Bulga Car Park also reported a male and female (or juvenile male) bird running through their site. It was hard for many of us to drag ourselves away from the calling birds and across to the guest house for breakfast. The last group back had been lucky enough toc come across a male in full display next to his mound. It wasn’t only Lyrebirds that were vocal on such a nice morning with Whip Birds, Tree Creepers Kookaburras and others adding to the morning chorus. Volunteers receiving instructions on our survey method. Eager volunteers working out how to get to their monitoring stations. All action at one of the sites with plenty of Lyrebird calls to record. One of our most popular volunteer activities is coming up on Saturday May 31st. 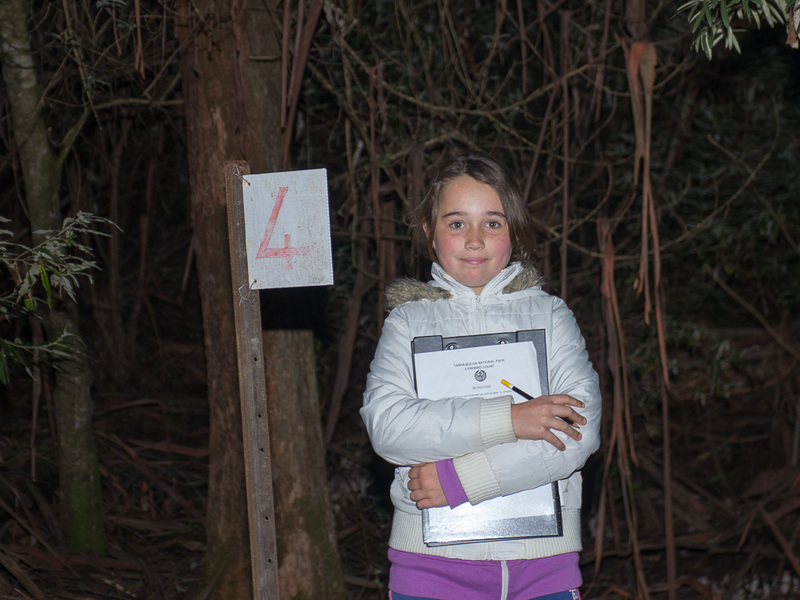 The survey, which monitors trends in the Lyrebird population involves an early start. The meeting place is at the Tarra Bulga National Park Visitors Centre at 6.15 am. On arrival the recording process is explained and people are allocated to various monitoring points around the Bulga Park area. The survey begins at sunrise with the first Lyrebird calls and only takes half an hour. Following the morning chorus, a free cooked breakfast is on offer at the Tarra-Bulga Guest House. If you would like to come along you need to contact ranger Craig Campbell (by Wednesday May the 28th on 5172 2508 or email craig.campbell@parks.vic.gov.au. Wear warm clothing, a parka, bring a watch, a torch and compass (optional). A couple of birds from our Remote Camera monitoring.